Analyst At Large: Since when is “Politician sits with people” news? Politicians in most mature democracies practice the common touch naturally. They take public transport, kiss babies, mingle with the people they represent…. All that is standard practice which hardly deserve news coverage. But, in Najib’s 1-Malaysia, the headline on prime page 3 space in the New Sunday Times today is “Najib mingles with the rakyat”. 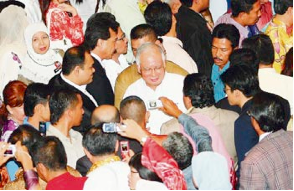 The crux of the article was prime minister Datuk Seri Najib Razak decided to deliver his 100th-day speech at the Kuala Lumpur Convention Centre rather than from his office in Putrajaya. PM Najib, in turn, was appreciative that the coterie of Tan Sri, Datuk Seri and Datuk ministers present deigned to sit together with the people. That’s a useful reminder of the heights of Barisan Nasional arrogance. It is a noble step for all those titled politicians to “give up protocol” and mix with us, the rakyat they are supposed to serve. It is a sacrifice that we, the rakyat, must appreciate! Still, I will grant that’s a step in the right direction. Unfortunately, like many Barisan initiatives, it looks skin-deep rather than a DNA-change. Elsewhere, when boss Najib is not present, the lordly instincts revert. Page 13 of today’s New Sunday Times is telling. Kelantan UMNO chief Datuk Mustapa Mohamed said he has “to advise his VIP friends to be extra cautious” and not come and go in flashy cars with police outriders that would annoy the villagers in Manik Urai. Contrast that with the Pakatan-led state governments. Chief Minister, plain old Encik Lim Guan Eng flies economy class. On a regular basis as he fulfils his duties as Chief Minister and Member of Parliament. Unlike the former BN Menteri Besar of Selangor, who spent RM1.7m visiting Disneyland and lives in an exclusive community, in a house valued at between RM3.5m and RM24m, depending on whom you believe. PS: The print edition of New Sunday Times today captions this as "PM ... mobbed by the crowd ... yesterday". The people in the background seem more interested in something else - notice they are all looking away from the PM! im basically rolling on the floor reading this.. bravo bravo.. so well said.. keep up the work!! i enjoy reading your blog.. Remember Pak Lah and Najib personally took KTM commuter/ LRT? I did not see Singapore PM took MRT to "show" the people that he is concerned about public transport and care about the people. Yet, Singapore has one of the best public transport infrastructure in the world. They even started the implementation and construction of MRT expansion for anticipated ridership up to year 2020! Not only they are able to stick to the plan, the even bring forward the target completion date for downtown line stage 3 and marina south extention. Back in Malaysia, see how long it took to complete our Rawang-Ipoh double track and the amount of cost overrun involved. Where is our LRT extension? Can't we have more transparent implementation plan like Singapore's? Are Malaysians so easily satisfied by mere promises or something ceremonial without substance? Where there is demand, there is supply.